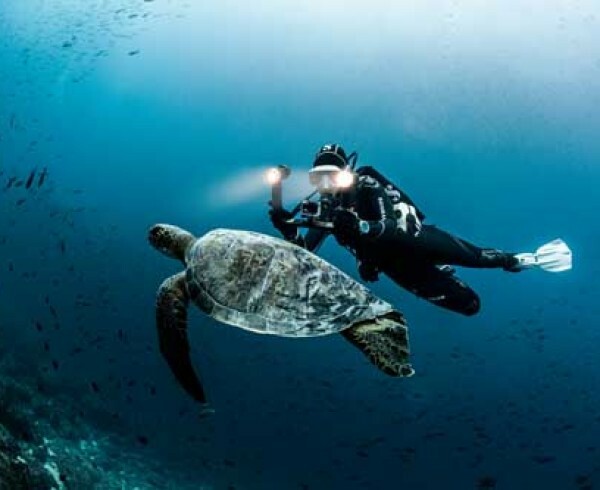 Digital has taken the underwater photography world by storm. Get in on the action with the PADI Digital Underwater Photographer Specialty course. You can quickly and easily capture the underwater world with your camera and on your computer… and you can learn to do so under Simply Diving’s very own professional photographer. During the PADI Digital Underwater Photographer Specialty course, you learn to use the PADI SEA (Shoot, Examine and Adjust) method, which takes full advantage of digital technology. The result is good underwater photos faster than you may imagine. Choosing and using modern digital cameras and underwater housings. Using the PADI SEA method for getting great shots quickly. Editing and sharing your pictures. The three primary principles for getting good photos underwater. Must be a PADI Open Water Diver or Junior Open Water (or have a qualifying certification from another training organisation). Certification counts toward the Master Scuba Diver rating. Contact us to find out how the PADI Digital Underwater Photography Specialty course can be started during the last dive of your PADI Open Water Diver course. Anyone with an average level of fitness can enjoy scuba diving. You don’t have to be an athlete! However, some medical conditions such as heart or lung problems could prevent you from participating. Before signing up for a PADI course, you will be required to complete and sign the standard PADI Medical Questionnaire [PDF, 120KB], with any “YES” answer cleared by a doctor. We recommend taking the form to your doctor for completion before you travel to Spain. The Costa del Sol has the perfect weather for taking a PADI course or just diving for fun, with over 300 days of sunshine per year. Hence its name! Summer daytime temperatures average 30°C (86°F), with winter around 16°C (61°F). Water temp October to April: 14 – 18°C (58 – 65°F). Due to our variety and huge range of dive sites, Simply Diving is the only 5 Star PADI centre in the area that can take you diving 365 days a year. Have a question before signing up for a course or a days’ diving? Have a read through our FAQs and set your mind at rest. Please note: All course prices include complete rental from our range of the latest and most modern Scubapro diving equipment; transportation to and from the dive sites in one of our air-conditioned mini-buses or by RIB boat; light refreshments (water, fruit juices and muffins); plus PADI certification on successful completion of your course. Extras: Educational materials such as PADI Crewpacks and manuals (required reading for most courses) and diving equipment can be purchased from the Simply Diving shop. Please email dive@simplydiving.com to confirm prices. Simply Diving Spain is the premiere scuba diving operator on Spain’s Costa del Sol with dive centres in Torremolinos close to Malaga airport and right in the centre of Marbella, just yards from the beach and our own RIB boat. We offer the ultimate in underwater experiences, whether trying scuba diving for the first time or as an experienced diver. As the only British-run PADI 5 Star Career Development & IDC Dive Centres in Spain, Simply Diving offers you the chance to take scuba diving lessons around colourful reefs, get the PADI Open Water Diver scuba diving certification or take advanced scuba diving and professional-level courses with PADI Instructors who are at the very top of their profession. Simply Diving, situated at two superb locations in the heart of the Costa del Sol, has been offering scuba diving trips, courses and PADI Pro training on Spain’s southern Mediterranean coast since 1999. Dive on wrecks, in marine parks, from boats or from the shore. There is no better dive centre in Spain to dive or learn to dive with than Simply Diving.